Alex’s Lemonade Stand is a nonprofit organization that works to raise money and awareness for childhood cancer research. The organization was started when Alexandra Scott, battling Neuroblastoma at just 4 years old, held her first lemonade stand and raised over 2,000 dollars. After doing this, she had the idea that if everyone hosted a lemonade stand they could raise enough money to conduct more research for those with childhood cancer. She had a goal of raising 1 million dollars and after meeting this goal she passed away. Since then, her legacy has been carried on by the foundation through hosting lemonade stands and various other events and fundraisers. 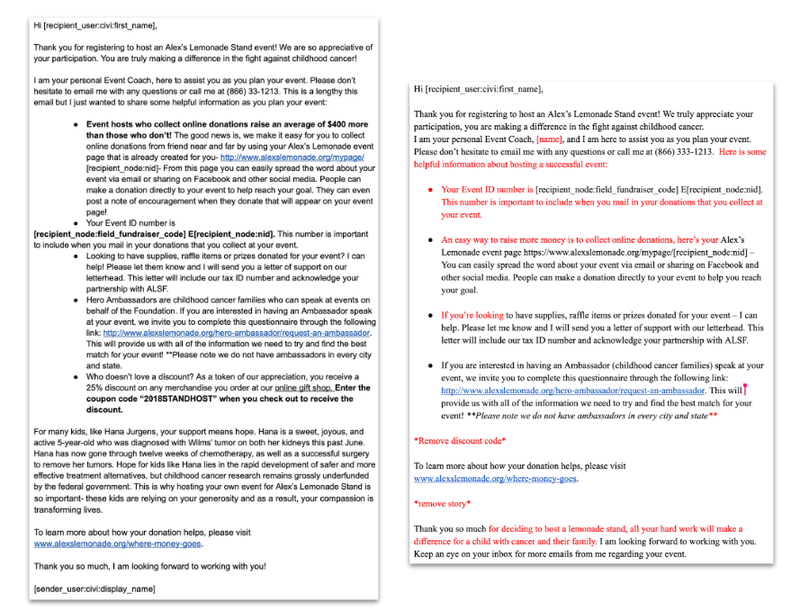 How can we effectively revise ALSF’s emails to make them more engaging? Alex’s Lemonade Stand came to Beautiful Social with the idea of revamping their email campaign. 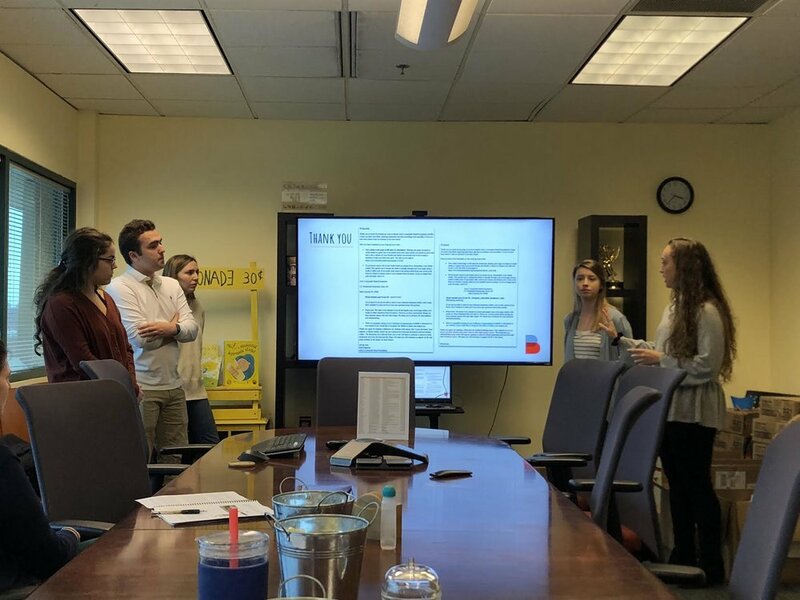 Their main task for us was to analyze and improve upon their current email methods used to communicate with individuals or groups that register to host their own lemonade stands through the organization. Their current emails lacked visual elements and were very text heavy, making it hard for the reader to get the necessary information. Our goal was to make engaging emails that will not only motivate fundraiser hosts to connect with Alex’s Lemonade Stand Foundation before and after their event, but inspire them to host again in the future. Our group knew that in order to find a solution for this challenge, we had to start with research. Through lots of research about marketing strategies, we found that having a clear concise message while still being able to form a genuine bond with the audience was a key factor in a successful email campaign. It was also important to find a balance between personal and professional voice throughout the emails. We wanted to make sure ALSF was seen as the genuine and personable organization they are without seeming unprofessional. The emails must also avoid being text heavy yet still be informative enough to keep the lemonade stand holders motivated enough to host another event. By using our research, we narrowed down the most important elements and began to formulate new emails that we knew would be more engaging. After conducting research on email marketing campaigns, we concluded there were four main components to a successful email campaign. We found that having visual elements, strong communication, a professional yet personal balance, and genuinity were the best ways to have strong and successful emails. We then analyzed each original email and changed the emails accordingly. To make the emails easier to digest, we trimmed down the emails as a whole to deliver the most information in the least amount of words. We removed a lot of the “fluff” that didn’t pertain to what the subject of the email was. We also came up further suggestions that we thought the organization would benefit from. These were things such as a fourth email and a possible welcome video. After we finished the revisions, our team presented our findings and finished product to the ALSF partners. They loved our ideas and gave us positive feedback on our work. By knowing exactly what our community partner wanted we were able to use our research and creative skills to create something new for them. They also gave us a lot of free range when it came to what they needed done. The creative freedom offered to us made it a lot easier to produce email revisions, but also other ideas that we think could benefit the organization. With the new revisions these emails serve not only as the primary source of information, but also as a way of connecting directly with an individual hosting an event in the most engaging way possible.